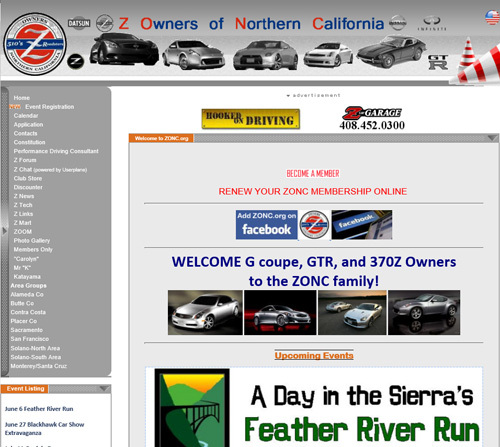 In 2006 I was excited to get the opportunity to become the webmaster for Z Owners of Northern California’s website ZONC.org. Let’s go back…. Way Back, to early 1999 where the first record of ZONC.org was made. ZONC was established in 1972 and incorporated in 1976, and the first ZONC.org site (photo below) was launched. 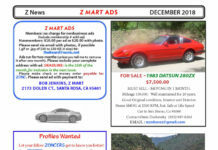 ZONC.org was simple and small compared to today’s websites. 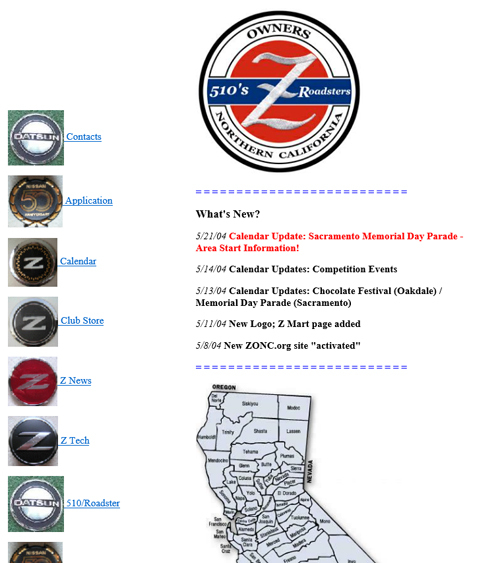 In early 2001 ZONC.org was changed a little and some new things were added, like ” back in time” and “Mr. K” sections. No real big changes happen for ZONC.org until May 2004 when icons were added and light design changes. 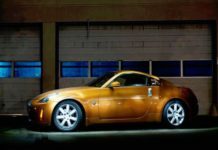 The next change to ZONC.org came in late 2005 when photo icons of Z and Datsun badges were replaced with blueish buttons, and a more straight down info text. 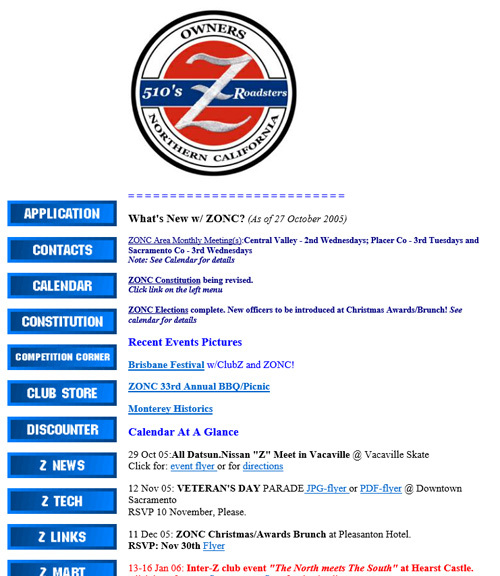 In mid 2006 I came on as webmaster for ZONC.org and wanted to organize and modernize the site. 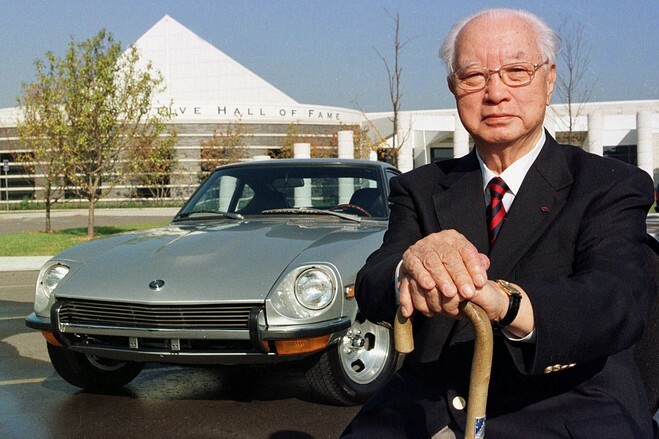 First design was not too flashy or overwhelming to the users. While I continued to learn the history and what users wanted from there website, I did not make any real design changes until 2008. For new years 2008 I delivered a new site with updated banners, web style, and now users could read the ZNews in a “flipbook”. 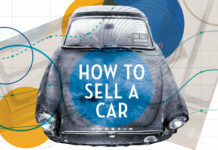 In early 2009 I was back at it again, trying to make ZONC.org better. I created the ZONC Facebook group to bring ZONC into the social media world. 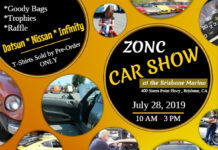 That year ZONC had welcomed Nissan GTR and Infiniti G owners to the ZONC family. 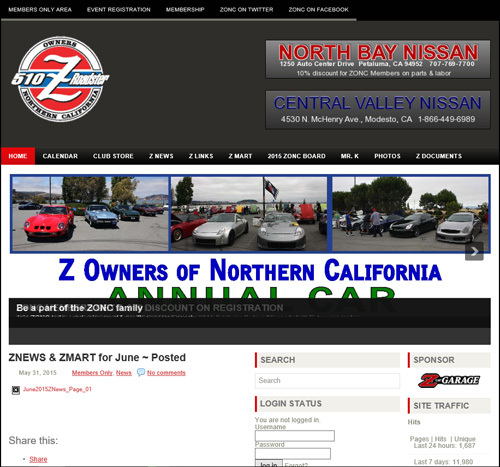 ZONC.org sported pretty much the same style until early 2015. The longest site style was 2008 until the big change in 2015 with a more robust security for the members. With the increase in SPAMing, and phishing on the internet, I needed to make ZONC.org bullet proof while making it user friendly. Early 2017 I upgraded ZONC.org with a lighter more modern style, while updating the core coding of the site. I added a image slider to the main page (slider did not show up on archive image below) and new member’s area. Now in December 2017 you might have noticed things being moved and site not quite right? No! Nothing is wrong with your eyes, ZONC. org undergoing a redesign right now. 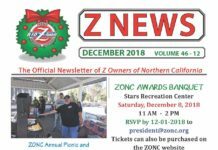 I am working to bring an all new ZONC.org for 2018! 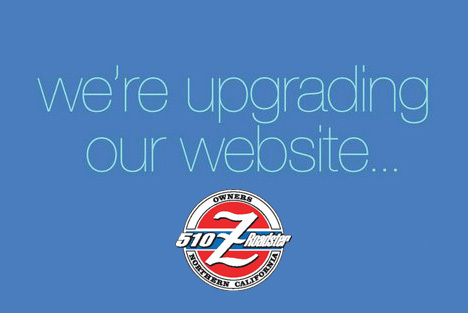 So just you wait and see, in the meantime things may look weird or out of sorts until the upgrade is complete. 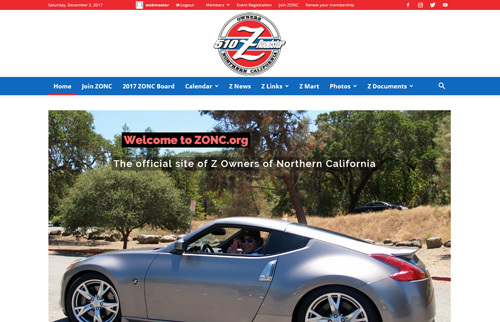 I am vary proud to have been the longest standing (siting at a computer) webmaster for ZONC.org. I am also excited to see what the future brings for ZONC and the members. Karl, thank you for your hard work!! Look forward to all the changes for ’18. The new look I logged into today is already sporting a new look and it’s much cleaner and easier to navigate. Keep up the good work! Karl, I just signed in today and love the new look! Thank you so much for all your hard work and dedication to making our site so inviting! I can’t wait to see all of the changes once you have completed your project!